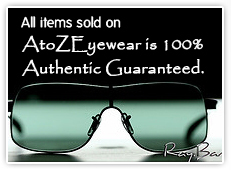 Our sunglasses are 100% authentic! All of our sunglasses are 100% authentic. They are brand new, never worn before and come with the original carrying case, cleaning cloth and papers of authenticity. We also have a 7 day return policy, so if you want to take your sunglasses to get inspected, please feel free to do so. We stand behind every pair of sunglasses we sell. We believe in great & friendly customer service both before and after the sale. We are to here help you and more importantly we are here to make sure your experience buying from us is so outstanding that you want to tell your friends and family. Place your order now, with confidence.